Columbia University scientists have developed a computational method to investigate the relationship between birth month and disease risk. 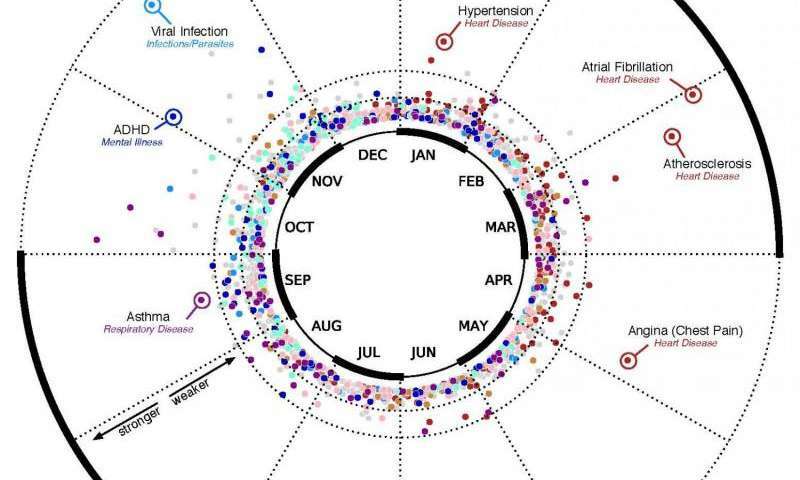 The researchers used this algorithm to examine New York City medical databases and found 55 diseases that correlated with the season of birth. Overall, the study indicated people born in May had the lowest disease risk, and those born in October the highest. The study was published in the Journal of American Medical Informatics Association. "This data could help scientists uncover new disease risk factors," said study senior author Nicholas Tatonetti, PhD, an assistant professor of biomedical informatics at Columbia University Medical Center (CUMC) and Columbia's Data Science Institute. The researchers plan to replicate their study with data from several other locations in the U.S. and abroad to see how results vary with the change of seasons and environmental factors in those places. By identifying what's causing disease disparities by birth month, the researchers hope to figure out how they might close the gap. Earlier research on individual diseases such as ADHD and asthma suggested a connection between birth season and incidence, but no large-scale studies had been undertaken. This motivated Columbia's scientists to compare 1,688 diseases against the birth dates and medical histories of 1.7 million patients treated at NewYork-Presbyterian Hospital/CUMC between 1985 and 2013. "It's important not to get overly nervous about these results because even though we found significant associations the overall disease risk is not that great," notes Dr. Tatonetti. "The risk related to birth month is relatively minor when compared to more influential variables like diet and exercise." The new data are consistent with previous research on individual diseases. For example, the study authors found that asthma risk is greatest for July and October babies. An earlier Danish study on the disease found that the peak risk was in the months (May and August) when Denmark's sunlight levels are similar to New York's in the July and October period. "Faster computers and electronic health records are accelerating the pace of discovery," said the study's lead author, Mary Regina Boland, a graduate student at Columbia. "We are working to help doctors solve important clinical problems using this new wealth of data." This will give Horoscope writers a field day. This "proves" that you have to take them seriously. I'll bet it's a "locality" phenomenon. Do the same test in different cities and see how it checks out. And then - different countries. Too much data massaging ?